The word “soufflé” brings up all sorts of other words and thoughts. The word chocolate, for one. Delicious, fancy, expensive, difficult, beautiful. Soufflé’s ARE delicious. They are light and rich and creamy and almost bread-like in some parts–all at the same time. Every once in a while we all need to shoot for the moon. Everyone has their “I made it” moment in a journey. And when I was first learning to really cook, making a soufflé (an edible one) was mine. It was my Mount Everest in the kitchen. I had seen them made on TV, eaten them in restaurants, and finally the time came to make one. I was so scared!! But I tried and took it ONE step at a time. And you know what? I did it! It was a huge shot to my chef self-esteem. But of course, along the way I have ruined soufflé’s as well. So when you try it, don’t feel bad if it doesn’t work out. Just try to figure out where you went wrong and correct it. I am happy to help with any questions! 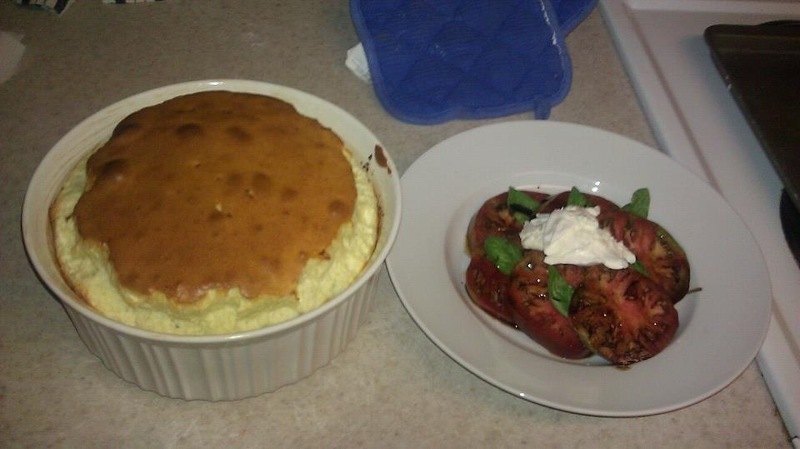 One tip I learned during my journey is that soufflé should never be made on a damp, humid or rainy day. Somehow the moisture in the air inhibits the rising and also the air in the egg whites. One thing that makes a huge difference is having your eggs at room temperature, especially the whites. It helps the air become incorporated more easily when they are being beaten. It really is best to use a soufflé dish for this. I bought a set of 2 at Target for about ten bucks and I use them all the time as serving bowls and casserole dishes. )I love making specialized kitchen equipment less special – haha!) More than anything it helps to go one step at a time. Relax! As you will see, I made a basic soufflé recipe just in case you wanted to completely change it up! For sweet just add ¾ cup sugar when beating the egg whites and then whatever sweet flavorings you’d like! Three is for the roux (pronounced “roo”) and the one is for greasing your soufflé dish. It HAS to be all-purpose. We need the fat in the whole milk for the chemistry of this dish. Nutmeg is a classic spice for béchamel (French white sauce) which is used as the base for many sauces & dishes, including soufflé. It’s a very strong spice, so very little goes a very long way. Make it a small pinch. Fresh nutmeg grated is best but dried is perfectly fine. The whites and yolks need to be separated from each other. Even though they are both being used, they are going in completely different steps and processes. If you forgot to bring them up to room temp then this is also a chance to take more chill off the whites! If you are not good at separating eggs with their shells here is a new way: get 2 bowls ready. Over one bowl, crack your egg, put one hand under the egg then open the crack. The whites will slide off your hand into the bowl and the yolk will stay. Then put the yolk in the other bowl. 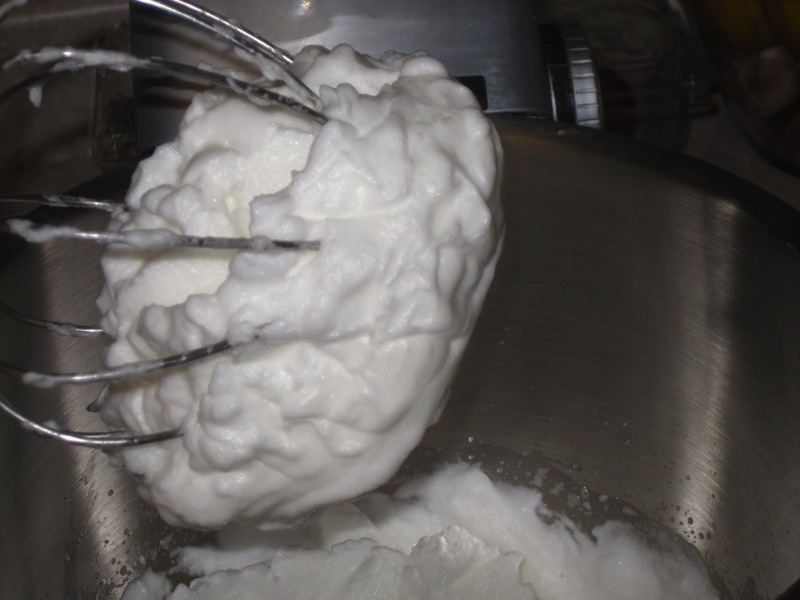 We are going to beat the egg whites until stiff and fluffy, just like meringue without the sugar. Cream of tartar is a stabilizer that keeps the egg whites from deflating. I had blue cheese I wanted to use up, so blue cheese is the flavor here! Feel free to use any kind of cheese you like. Spinach and cheddar is a classic. The parmesan is for greasing the pan. It adds a thin, salty, soft crust to the outside. YUM! I am a stickler for Parmesano Reggiano (the only true parmesan in my opinion). Trader Joe’s and Costco have great prices for it. Just use quality parmesan – no green cans here. You can use shredded or, my personal preference, crumbled. I just toss it in the food processor with the regular blade on. I love a little heat with the blue cheese’s sweetness. This is a totally optional ingredient and amount for that matter. I really prefer gorgonzola or the English classic, Stilton. No matter what kind you use (and no matter if you’ve used that brand before) with blue cheese and recipes like this where it’s center stage in flavor I like to taste the actual block I am using. It helps gauge how much salt to add. One time I made blue cheese crackers for a get together I was having. I didn’t do this and my beautiful crackers were practically not even edible because they were so salty. Preheating is ALWAYS important but especially in soufflé’s. The heat from the oven causes the steam from the water in the egg and butter to “puff”. Butter the inside of your soufflé dish and sprinkle evenly with ¼ cup of Parmesan. To evenly distribute the cheese I roll my dish like a wheel. Warm the milk in a small saucepan over medium to low heat. We are technically going to “scald” the milk – that is the technical term. But we don’t want it so scalded that it develops a skin. To avoid this, put the milk on low heat and just watch for small bubbles forming along the rim of the saucepan. When you see them, the milk is ready. Either reduce the heat or turn it off at this point. Melt the butter in a small saucepan over lower heat. Stir in the flour and cook, for 2 minutes, stirring constantly. We are cooking out that raw flour taste. It will keep the béchamel and eventually our soufflé from tasting like kindergarten paste. The butter/flour combination (notice how it was equal amounts of both?) is the roux I mentioned earlier. Off the heat, whisk in the hot milk, 1/2 teaspoon salt, black pepper to taste, the cayenne, and nutmeg. Cook over low heat, whisking constantly, for 1 minute, until smooth and thick. The whole point of warming the milk is so that it is the same temperature as the roux. Ingredients blend together more easily when they are all the same temperature. And we want this sauce to be smooth as silk. It should be thick enough to coat the back of a wooden spoon. It may not happen instantly, so give it about 5 minutes. Off the heat, whisk in the egg yolks, one at a time. Stir in the blue cheese and the 1/4 cup of Parmesan. Pour into a large mixing bowl. Doing the yolks one at a time just helps ensure that the eggs don’t cook before getting into the sauce. Whisk the egg whites and cream of tartar in a separate mixing bowl. Start on the low setting, then gradually increase on to high speed until they form firm, glossy peaks. Here is a picture of what they should look like when they are ready. Whisk 1/3 of the egg whites into the cheese sauce to lighten and then fold in the rest. Folding is a technique usually used for recipes like this where regular stirring would not be productive. Folding is basically very gentle stirring. We just got all that air into the egg whites. Stirring roughly would take it all out. Pour into the soufflé dish, and then smooth the top. Draw a large circle on top with the spatula to help the soufflé rise evenly, and place in the middle of the oven. Turn the temperature down to 375 degrees F. Bake for 30 to 35 minutes (don’t open oven!) until puffed and brown. Serve immediately. It’s going to puff up in the oven a great deal. Smoothing the top and drawing the circle helps it puff straight up rather than up and over the side. I recommend baking it with the dish on a cookie sheet just to keep it even. And don’t you dare open that oven door!! It will deflate your soufflé for good. This is the kind of dish that must be served right away. It will deflate slightly when taken out of the oven so don’t panic. Enjoy the soufflé and give yourself a huge pat on the back! You did it! Recipes coming up soon – chocolate-avocado smoothies, turkey/veggie meatloaf, macaroni and cheese, lamb chops w/ chimichurri, rosemary-chocolate chip cookies…..lot’s of freezer friendly!